No matter what stage you are in the wedding planning process, you will find vendors! The Premier Bride Expo is also proud that no matter what your wedding budget, there are vendors at our shows that can serve you! If you are eloping or having a platinum wedding…we have wedding vendors from Jacksonville, St. Augustine, Orange Park, Ponte Vedra, Amelia Island, Southern Georgia and other areas that can help you! Here are some of our vendors that will be attending the Premier Bride Expo on September 13th! If you are looking for your wedding photographer, make sure you stop by and see Kris Graham Photography, Dan Harris Photo Art, Favorite Photography, Angela Christine Photography, or Elegant Imagery Photography! Our photographers have had many magazine features, showcasing their clients wedding day. They also have years of experience and you can trust that they will take care of you on your big day! If you are looking for unique products or services come and see Joel Bagnal Goldsmith, he can create your custom wedding bands and rings. Thirty-One Gifts can create some great bridesmaid gifts for you and your new monogram! Kouture Kreations creates custom paper goods from wedding invitations, to save the dates, programs and so much more. 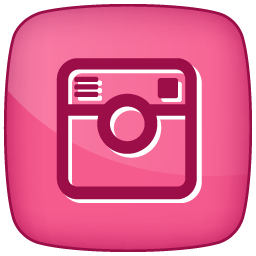 More vendor information to come in following posts…so check back! All of the bridal shows have a theme. The themes allow vendors to use their creative talents to decorate their booths and showcase their abilities. Of course, it is not mandatory to participate in the theme…but we do encourage it! 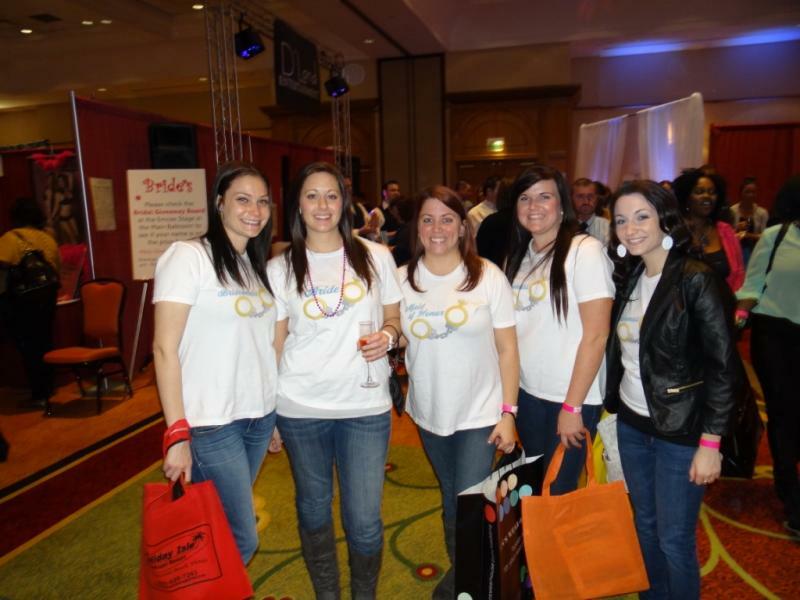 Brides, grooms, friends, and family all came to the expo to get ideas and meet their potential wedding vendors. Since the bridal show was located in St. Augustine, many wedding vendors are from that area. However, we also have many vendors from Jacksonville and the other surrounding areas. Since St. Augustine is one of the most popular destination wedding locations, we often see brides and grooms from Georgia, Alabama, other states and other cities in Florida attend. 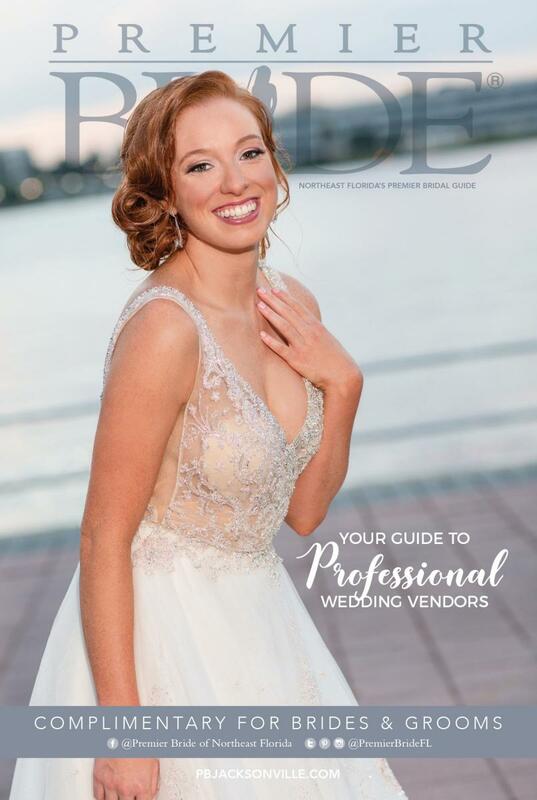 Make sure you check out the planning guide that you can find in the back of the printed Premier Bride magazine or you can go online to www.PBJacksonville.com and download a free guide complete with a wedding planning checklist. 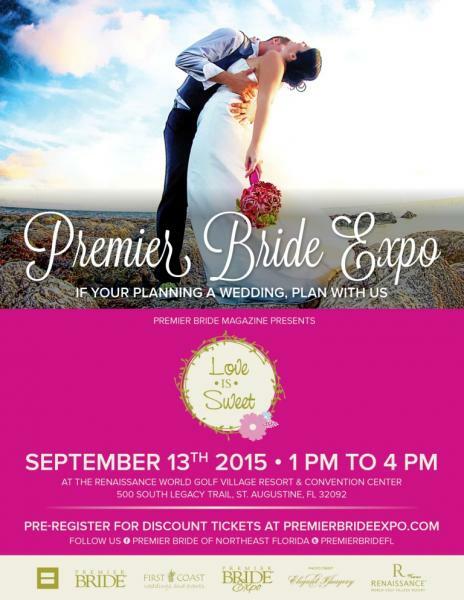 At each expo you can always find a free copy of Premier Bride magazine…make sure you pick up your copy. Premier Bride magazine always features local weddings, so if you are getting married on the First Coast or Historic Coast…submit your wedding you could be in the next issue of the magazine! 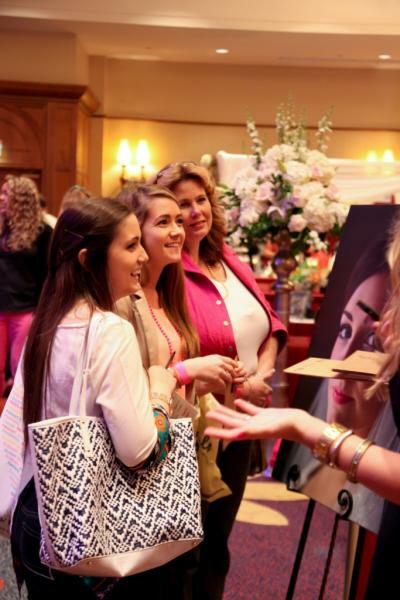 See you at the next bridal show in Jacksonville! 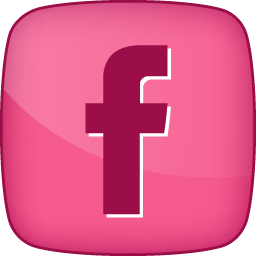 Thinking about attending a bridal expo? Great idea! Coming to a wedding expo is every brides and grooms rite of passage in planning a wedding! How do you know you are attending a “good” bridal show? In the Jacksonville, St. Augustine, Amelia Island, Orange Park and surrounding areas, there are many bridal shows and bridal open houses. Some shows are small and some are large, like the Premier Bride Expo. All of the 100+ vendors that participate at the Premier Bride Expo have been checked to ensure they have the proper licenses and insurance that the state of Florida requires. We want to ensure that the very best vendors attend the show. 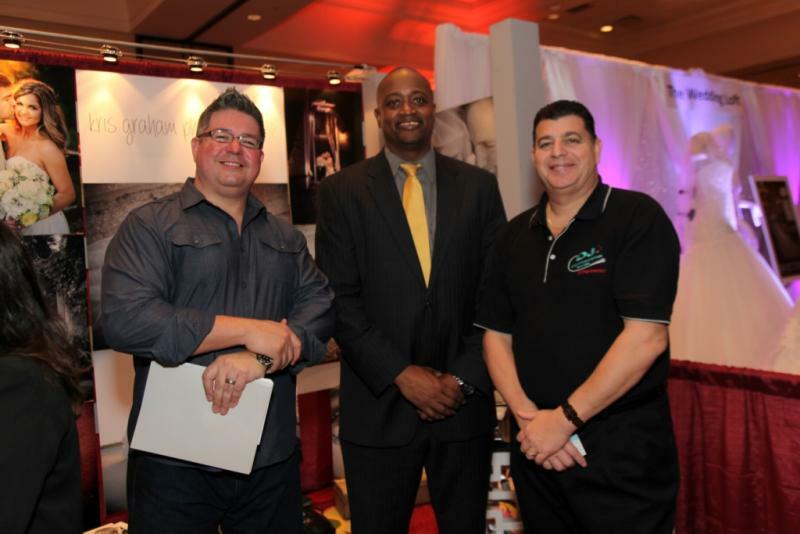 No matter what stage you are in the planning process, you will be able to meet vendors at our show. There are category limits for each category so brides and grooms meet many different types of wedding vendors. Check out the wedding shows in the Jacksonville area here! Labels. One of the best bridal expo tips we can give is for brides and grooms to make labels that you can use to give to vendors, prizes and use for your registration. Make sure you include the following on each label; Name, wedding date, phone number, address, email address, and wedding location (if you have one or the city you want to be married in)! Print off 20-50 labels and bring them with you the Premier Bride Expo. At each Premier Bride Expo, each couple will be given a swag bag…so you will have something to carry all of the information and goodies you pick up at the show. If you have ideas or pictures of something you are looking for…bring them with you! Vendors will be happy to discuss with you your ideas. Who should I bring to the show? Bring the decision makers. If you and your fiancé are making all the choices…bring them. If your parents are helping, bring them. If some of your close friends are helping you plan, ask them to come. Be careful about bringing everyone…unless you are willing to hear all of their opinions. Sometimes bringing too many people can become stressful. We recommend just coming with the major decision makers, that way you can make decisions and the expo! The dress code is casual. We are in Florida so flip flops, sun dresses, shorts and tank tops are perfectly fine! There are a lot of pictures taken at the expo and video, so just be aware you might be on camera! How much time does it take to walk around the show? This depends on what stage you are in the planning process. If you are in the beginning stages and you want to talk to lots of vendors, it might take you 3 hours. If you are at the final stages of planning, it might take you 30 minutes to an hour to walk the floor. There are lots of things to see, live music to listen too, food to taste and so much more. Kids are allowed but they are not encouraged. Kids under 5 are free, but over 5 they will need to purchase a ticket. If you can find a babysitter, we suggest it. You will enjoy the show a lot more without having to keep an eye on the little ones. There are lots of decorations and breakables on display! Yes, we give away lots of prizes! This is why you should bring labels. Almost all the vendors have a prize at their booth. Each vendor decides how the prizes are given, some are given away at the main emcee booth and others are given away at the vendor booths. The honeymoon/trips are always given away at 3:45 pm at the main emcee booth. 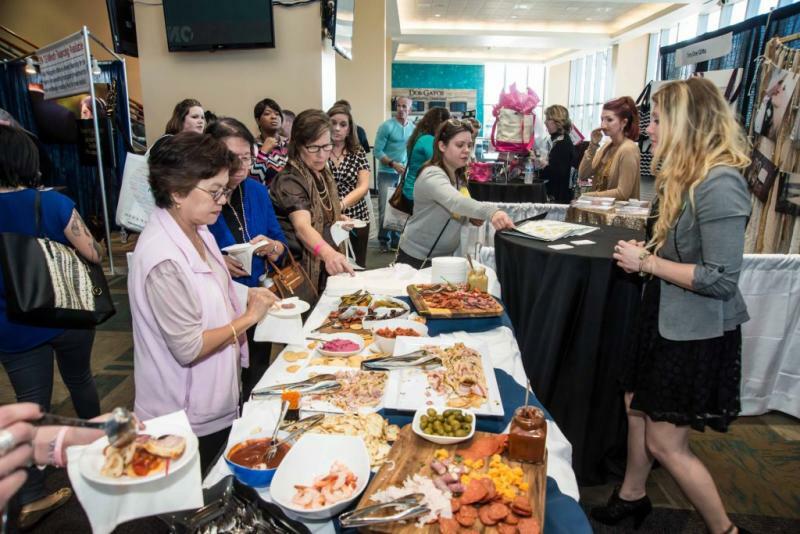 Premier Bride Magazine was a proud sponsor the first wedding expo at Everbank Field, home of the Jacksonville Jaguars, on January 18th 2015. 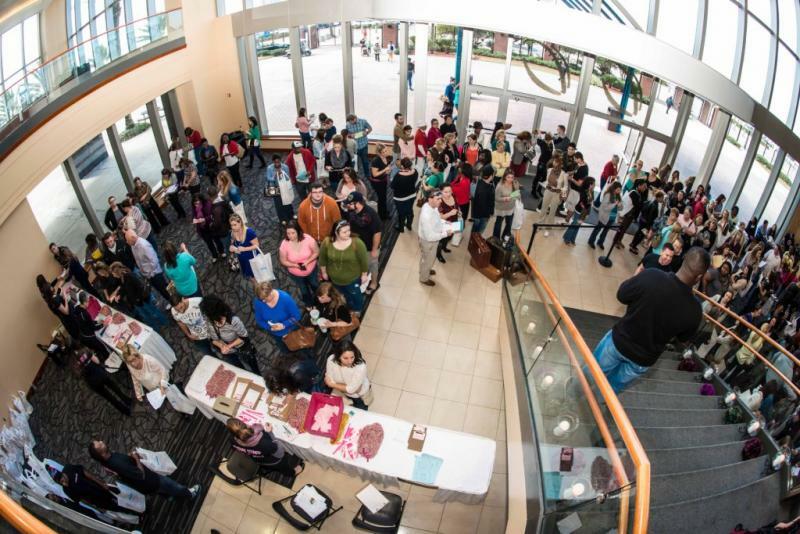 The first bridal expo ever hosted at Everbank Fields, West Touchdown Club was a huge success! Brides, grooms, friends and family members all came to experience 3 floors or wedding bliss! Over 100 vendors filled the Touchdown Club with food, fashion, tents, live music, décor, cakes & sweets, beautiful photos and so much more. The theme of the show was “Steampunk.” Steampunk is all about the turn of the century inventions…it is like a Victorian pirate. Gears, light bulbs, typewriters, lace, top hats, corsets, feathers and deep, rich dark colors is what Steampunk is all about! Check out the fashion spread in the new issue of Premier Bride Magazine for more inspirations! Like all wedding expos, every couple that comes to the expo gets a swag bag full of goodies and information. There are plenty of prizes to be won and gifts to be given away during the bridal show. We always encourage any couple planning a wedding to attend a bridal show. It is a fun way to meet your potential vendors! At the bridal show you will find wedding vendors that service the Jacksonville, St. Augustine, Amelia Island, Orange Park, and surrounding areas. Even if you are getting married in another city in Florida or having a destination wedding, many wedding vendors will travel. Keep in mind that you have purchase many elements to your wedding on a local level…so you can find something for your wedding here! We hope that you join us at the next bridal show at Everbank Field in June! 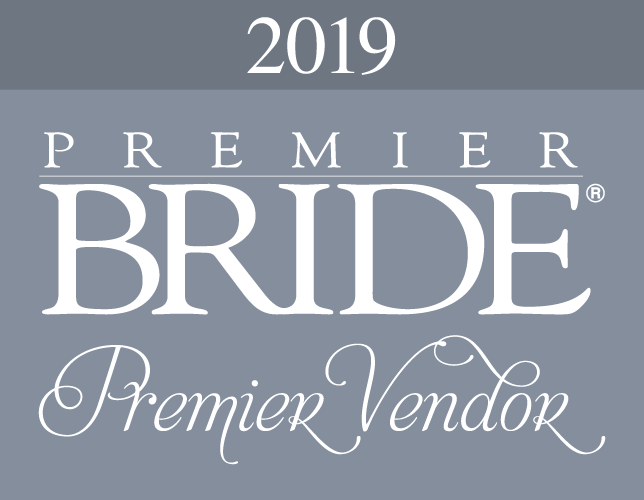 Premier Bride Magazine presents the Premier Bride Expo at Everbank Field, home of the Jacksonville Jaguars, on June 28th 2015. If you are planning a wedding, plan with us! Everything you need to plan your wedding will be at the Premier Bride Expo! Bring your fiancé, friends or family with you to the West Touchdown Club on June 28, 2015 from 1-4 pm. Explore 3 floors of wedding vendors! 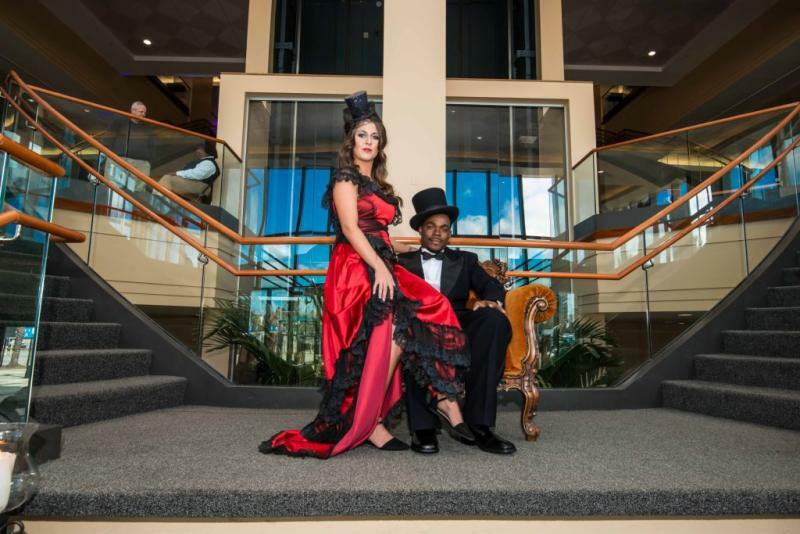 Jacksonville's top wedding professionals will be at the expo. Wedding receptions, photographers, DJ's, cake bakers, caterers, bridal attire, decor companies, transportation and so much more! Every couple that comes to the expo gets a swag bag full of goodies and information. There are plenty of prizes to be won and gifts to be given away during the bridal show. 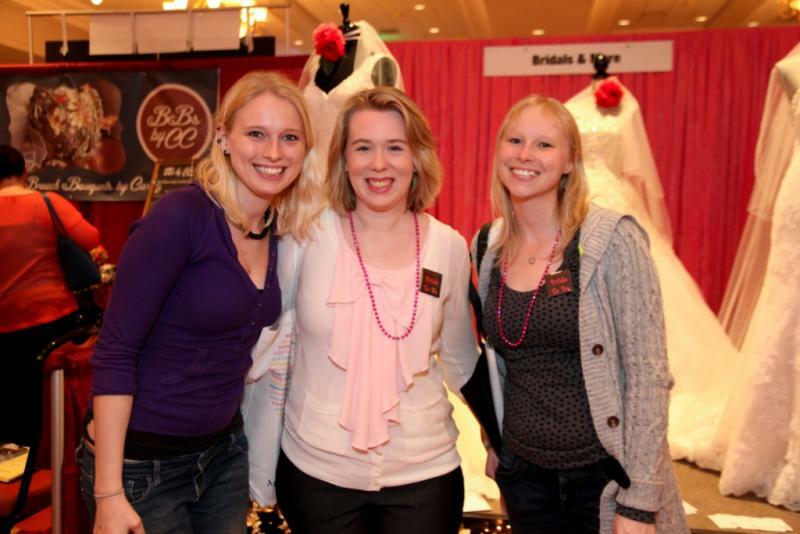 A bridal show is a great way to meet your potential wedding vendors face to face! It explores all of your senses too; taste test delicious food and wedding cake, see trends in weddings, smell the flowers, hear live music and touch the popular fabrics used in wedding dresses. Attending a bridal show is a right of passage for couples…so don’t miss out on your chance. Our wedding prize board is located in the lower club, by the circular bar. Footloose Entertainment is our emcee for the show. Throughout the show, Footloose will draw names of registered couples. Make sure you check the prize board to see if you have won. Names are written on the broad and you can claim your prize with Footloose. Unclaimed prizes will be raffled off at 3:45 pm. This is when the grand prize is also raffled off. The grand prize is typically a trip or two or three! In almost all cases you need to be present to win. Many of the wedding vendors also hold special drawings at their booths. 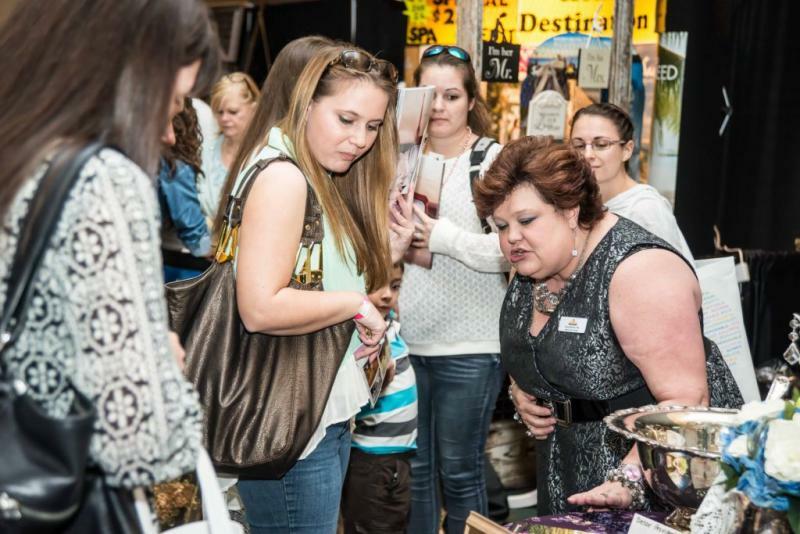 As you make your way around the show, talk to the vendors and they will tell you about their prize or special that you can take advantage of at the show. One thing that makes the Premier Bride Expo unique is the live music. We love to feature ceremony musicians and bands that you can hire on your wedding day. We have a stage area where you can sit and enjoy the live music. Tickets to the show can be purchased online or at the door. We recommend that everyone who can, pre-register and pre-pay. If you can’t print your tickets don’t worry, we can look you up by your online registration at our help desk at the show! Premier Bride Magazine sponsored the 4th show at the Renaissance Resort at World Golf Village in St. Augustine on February 23rd 2014. Each time we have a show it seems to get better and better! We had over 135 booth spaces on the floor, including a live music stage where 4 bands and musicians played 35 minute sets, entertaining the brides and vendors! 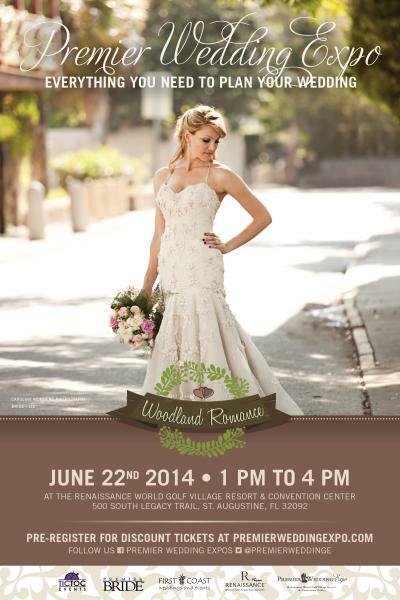 Over 400 brides and their entourages came through our doors and spent 3 hours meeting with wedding vendors. The entire ballroom was filled with vendors, over 110 unique business representing over 17 different wedding categories. 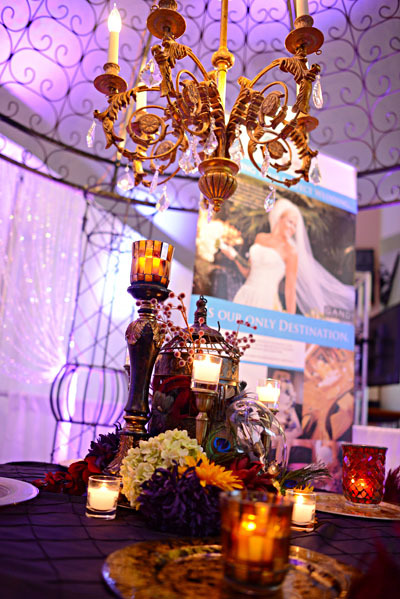 Everything a bride needs to plan her wedding could be found at the Premier Wedding Exp in St. Augustine! At the bridal show, we were able to give away thousands upon thousands in prizes and give-a-ways – including not one but two trips! 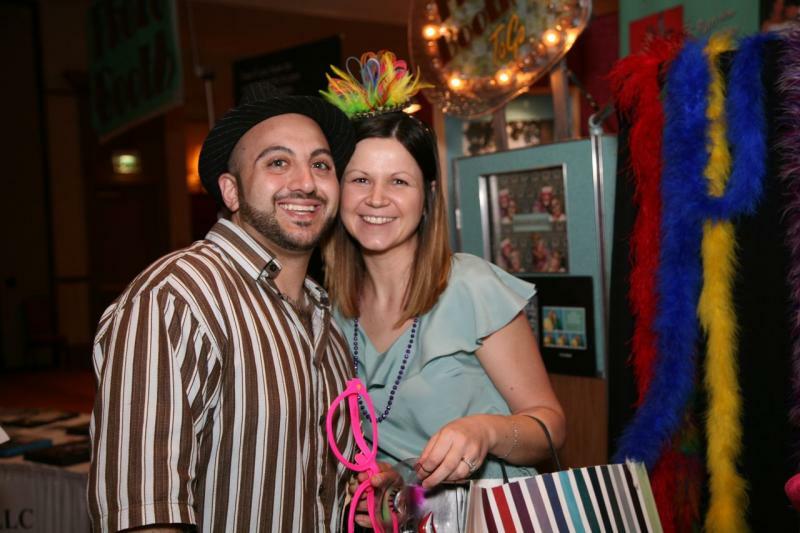 Two lucky brides won vacations, one seven day trip and one three day trip as the grand prizes. Brides and grooms also won engagement rings, spa trips, photography packages, jewelry, gift certificates, dinner gift cards, bottles of wine, $100 gift certificates from WeddingStar and so much more! No bride goes home empty handed at, each bride that walks through the door gets a swag bag full of goodies, information and free magazines like Premier Bride and WeddingStar! 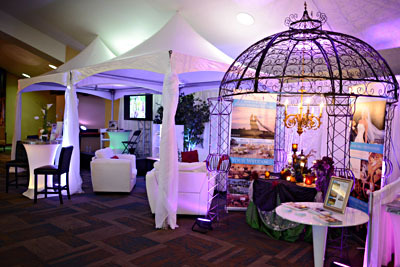 We were excited to welcome some new exhibitors to our St. Augustine bridal show! The first time exhibitors to this show were; Box of Brilliance Wedding Videos, Carnival Cruise Lines, Chloe + Isabel Jewelry by Fabulous with V, Courtney Whtiehurst Photography, DJ Connection, Flowers OMG, I Do Glamour, Jade Violet Wedding Floral Boutique, Mattamy Homes, Ocho Ink Productions, PIATA, The Backstreet Blazers Band, The Pioneer Barn, The Lovely Loo, The Reflections Studio, and the Watercolors by Liz! For a complete list of all of our vendors, and their profiles click here! Our next bridal show in St. Augustine is taking place on June 22nd at the Renaissance Resort, make sure you pre-register online if you are a bride and reserve your booth space if you are vendor! We do sell out every shows and some categories sell out quicker than others….so don’t be left out! A bride, her bridesmaid and mom meeting vendors! Kris Graham Photography, McGee Entertainment and DJ Connection - awesome vendors! Premier Bride Magazine is a proud sponsor of the bridal show in St. Augustine Florida at the Renaissance Resort at World Golf Village. This show kicks off the summer bridal show season for North Florida and you don’t want to miss meeting over 100 professional wedding vendors ! If you are planning a wedding….plan your wedding with us! All of the vendors at the bridal show are true wedding professionals. They specialize in their wedding category and are eager to meet brides and grooms to help them plan their wedding day. No matter what stage you are in your wedding planning process, the wedding expo has something for you. In the beginning stages you are looking at reception venues, wedding dresses, wedding planners and photographers. The middle stages you book your DJ or band, cake designer, invitations, videographer and at the end you look at honeymoons, gift registries, and transportation. Of course there are many other categories that are part of your wedding planning process…so attend the show and meet the vendors that will complete your day! Here is the latest show poster for our June 22nd show in St. Augustine. This photo was taken by Caroline Momberg Photography and the beautiful bride is Liz. The theme for the show is “Woodland Romance.” Visit our Pinterest board for our inspiration behind the theme! You’re engaged – hooray! Now the fun begins of planning a lovely wedding… trying on wedding dresses, registering for gifts, choosing the perfect party favor and so much more. Then reality sets in, and you discover that planning a wedding takes an incredible amount of work. It requires making countless decisions, handling thousands of details, juggling endless tasks and errands, and doing it all while also maintaining your relationships, job, life and sanity. What’s a stressed-out bride-to-be to do? For starters, take a deep breath, every bride has gone through this process. By following a couple simple steps you can make the process of planning your wedding much more enjoyable! Start early. Obviously, the more time you have to plan, the more breathing room you have, and the more options you’ll have for wedding vendors. Give yourselves at least a year if possible, so that you can spread the work out over time, and have the most flexibility in securing your first-choice vendors. If you plan on having a whirlwind wedding we recommend that you hire a planner, their guidance can make the process run smoother if you getting married in a 2-8 month time frame! Hire a planner. Your experience will be better and so will your families. Not everyone can afford to hire a full service coordinator, but at least leave room in your budget for the day of coordinator. Trust us, someone needs to be guiding and directing wedding vendors, guest, and the bridal party the day of. You do not want to be left with making all of the decisions…you want to be enjoying your day! 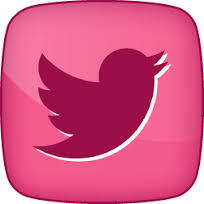 Attend the Premier Bride Expo. The Premier Bride Expo only allows professional wedding vendors to exhibit. Each exhibitor specializes in weddings and events and they are eager to help you plan your special day. A bridal expo is a great resource. Typically there are 60 to 125 different vendors in a wide range of categories. If you are in the infant stages of planning your wedding, come to the expo to meet your wedding planner, research wedding venues, look at photographers work and set appointments for the dress shops. If you have those elements planned, then come to the expo to find a videographer, a florist, taste test cakes, check out honeymoon locations, pick out invitations, start your gift registry, find a makeup artist, listen to a live band or DJ or meet décor and rental companies. And if you have everything planned….there are vendors you can meet with for life after the wedding, like financial planners, home builders, and other service companies! Our bridal shows are in Jacksonville, St. Augustine, Jekyll Island, Savannah and Daphne AL. Click here for upcoming shows! Stay organized. Here are the basics you’ll need to manage all the details, deadlines and duties: Have one large manila envelope to hold all contracts and receipts. Have another one on hand for all information, ideas, notes and resources. (This could also be a binder, or an accordion file… whatever works for you, just as long as it’s all in one place.) Keep all wedding-related books, papers and other items in one place – the bookshelf in your home office, the corner of the guest bedroom – so that you always know where to find something. And finally, write everything down. Keep a “wedding notebook” and a detailed calendar where you can put everything in writing. Don’t assume you’ll remember – 47 details later it may be gone! 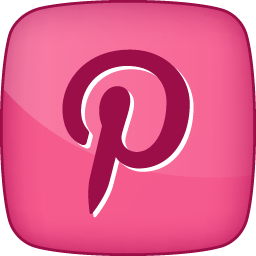 Click here for the Premier Bride Planning Guide Tips. Take breaks. It’s easy to get so wrapped up in all things wedding that you forget to see movies, visit with friends on non-wedding topics, catch up on the world news… Take regular restorative breaks from wedding planning where you don’t think about, talk about, or work on anything wedding-related. And remember there is life beyond the wedding! Cultivate gratitude. When frustration or stress overwhelms you, take a moment to focus on everything going right, and everything in your life that is good. Write them down, or call a friend to share your ‘gratitude list.’ You’ll feel better in no time and regain your perspective. This is also a good time to take a break – see above! And, call your wedding consultant and let them help. We hope this tips will help you plan the wedding of your dreams and we hope to see you at the next Premier Bride Expo! The Premier Bride Magazine is excited to sponsor the bridal show in St. Augustine Florida! The show is located at the Renaissance Resort at World Golf Village in the large convention ballroom at the resort. Each February and June the expo comes to the halls in St. Johns Country. Almost 140 booth spaces fill the floor. Wedding vendors from St. Augustine and the surrounding counties occupy the booth spaces. Everything you need to plan your wedding can be found at the expo. Many St. Augustine wedding reception venues can be found at the show like; Colonial Quarter of St. Augustine, The Hilton Historic Bayfront St. Augustine, Holiday Isle Ocean Front Resort, King and Bear, Slammer and Squire Club Houses, Marsh Creek Country Club, Renaissance World Golf Village, Serenata Beach Club, St. Johns Golf and Country Club, The Palencia Club, The Pioneer Barn and The White Room! In addition to the St. Augustine reception venues, you will also find venues in Jacksonville, Orange Park, Amelia Island, Southern Georgia and other parts of Florida! St. Augustine is a big destination wedding location and if you are a destination bride…there will be many local vendors. Other St. Augustine local wedding vendors include; Cadeau, wedding invitations and gift registries, Chloe + Isabel by Vanessa Kromer, great for bridesmaid jewelry, wedding jewelry and fashion jewelry, Daniel Thompson Bridals , custom wedding dress designs, Jade Violet Wedding Floral Bouquets, flowers, Jill Stonier Professional Makeup Artist, Joel Bagnal, Goldsmith, Michaels Formalwear has a location in St. Johns County, Old Town Trolleys, wedding day transportation, Watercolors by Liz, paints your wedding dress, and the St. Augustine Wedding and Events Association! Everything you need to plan your wedding will be at the bridal expo. Over 130 wedding booths will be filling the floor! If you pre-register you will receive a special email detailing the prizes and give-a-ways for the show. It is fun to pick a wedding theme! Since we live in the South, we love Mardi Gras and here is our take on how you can decorate your wedding with this theme! A bride might not want a full on Mardi Gras theme…so we toned it down a bit calling it “Midnight Masquerade.” This allows you keep the feel of Mardi Gras but change the colors and the tone of the event. When creating your wedding inspirations boards it is important to find elements that inspire you or move you. Never do you want to copy someone’s work or ask your wedding professionals to duplicate it to a T. Be creative and let your wedding pros be creative so they can create a wedding that is yours and yours alone. Unique is key! A dark red, black or grey would be our color choice for the bridesmaid dresses. We prefer the deep red in a chiffon fabric that is flows. We would suggest a long dress for the more dramatic look. If you are having a masquerade, then you have to have masks. This is where we would splurge on the budget and make your guests masks dramatic so they get into the theme as well. Each mask could be their name card when finding their seat and entering into the reception. Keep the masks in neurtal colors like silver, black, or gold so they go well with the guests outfits. Splurge on a mask of your own. Make sure your mask will stay on your face without holding it. You will be doing a lot of hugging and dancing and you want your hands free. For your bouquet think about a brooch bouquet – it is a perfect theme to rock this look. Or we love the white and black flowers with hints of feathers in the bouquet. Cocktail hour or ceremony…or both…think about hiring an opera singer. It can’t get more romantic and perfect for your wedding theme. 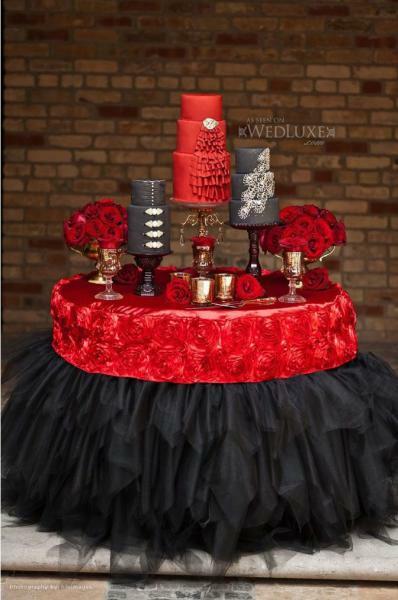 We love dramatic and over the top cake table displays….and you can go all out. This two colored multi fabric table cloth is stunning. We also like a bold wedding color for the cake…possibly red? For the reception décor for “Midnight Masquerade” we love roses and candelabras. The romantic glow of candles sets a perfect tone and roses are classic and elegant choice. Dramatic lighting and warm tones will enhance the experience. If you have the ability of hosting your reception in an old theater…do it. Having this theme in an historic theater would set your wedding over the top!